The full text of Vine of David’s new English translation of the Didache. How an Apostolic-era, Messianic manuscript disappeared for 1400 years and has now been rediscovered. The story of how a nineteenth-century rabbi became a pioneer of Messianic Judaism. Boaz Michael opens this issue with comments about the release of the new Vine of David resource, The Way of Life, a new translation of the Didache with Messianic Jewish commentary. He also brings us up to date on several other pending projects. Several high-profile people in the Messianic Jewish community share their thoughts and recommendations on The Way of Life. Toby Janicki tells the story of how the Didache was discovered and what that dicovery meant to the Christian and Messianic Jewish worlds. 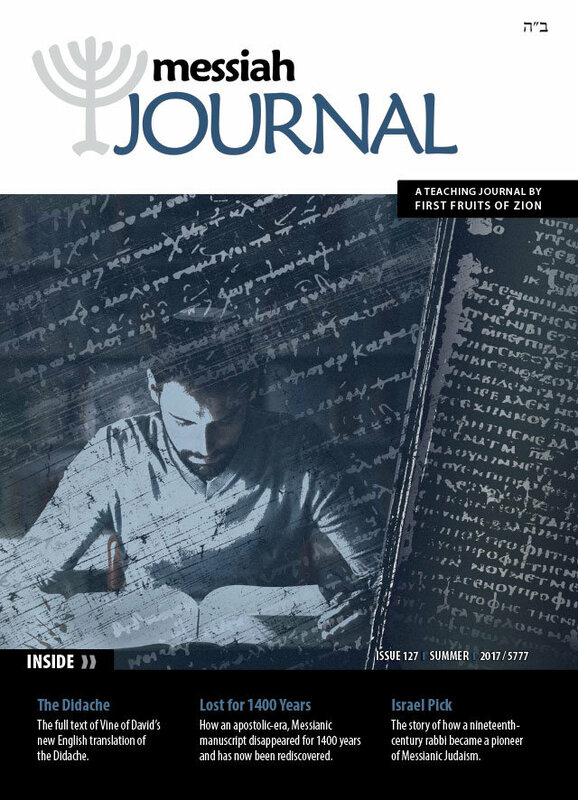 In this issue of Messiah Journal the entire text of the new translation of the Didache is presented. In this article, Toby Janicki shares the trials and joys of working on this monumental project, bringing this historic document to life for the modern community. Guest writer Daniel Nessim writes about how the Jewishness of the Didache influenced the church. He presents the case for restoring the Jewishness of our faith in Yeshua. This article by D. Thomas Lancaster is an excerpt from his book Elementary Principles: Six Foundational Principles of Ancient Jewish Christianity. Hebrews 6: 1-2 lists instructions about washings as one of the basic things believers should know. Mr. Lancaster helps us discover an ancient Christian ritual practiced by the early first-century believers but that as long been lost and forgotten. How did the Apostles envision Gentiles approaching the issue of corporate, liturgical prayer? Aaron Eby discusses the implications of Gentiles joining with the Jewish believers in the prayers of Israel. Sheldon Wilson presents the concept of hypocrisy as it was originally conveyed in the world of the apostles. When understood in this light, the sayings of the Master on this subject make more sense. Part 2 of 2 in the moving story of Israel Pick, the great nineteenth-century pioneer of Messianic Judaism.